When did running begin for you? When I was at university; a friend asked if I wanted to do a half marathon and I said yes. It was less than a week away! I got round, but going down stairs was not easy for a week! After that, I occasionally ran with friends. It wasn’t until I joined Waverley Harriers that I started running regularly and was introduced to the concept of “training”. My main reason is social fitness – it’s much easier to burn off chips when there’s someone else to talk to. Also, rule one of zombieland. What race or moment in your running career holds the most significance and why? 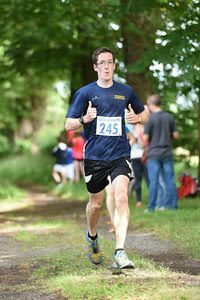 Surrey Half last year – it was the most run I’ve had in a race and I got my current personal best there, which was much better than I was expecting! There was a good turnout of Harriers all in matching tops, which made me feel like a proper runner. Even the heavy rain was enjoyable. Who is your running inspiration? There are too many great runners in the club to choose from. At training I have several nemeses – people I’m trying to match form or pace with. Claire Maxted’s videos on Wild Ginger Films are my current inspiration – thanks for the recommendation Dave. What event, past or present, would you like to take part in and why? Moon landings, or is this supposed to be running related? What golden piece of advice would you give to other runners? If you get injured, do something about it! I learnt the hard way because I was stubborn. There are many in the club who have been through injuries and have good advice – or at least a physio on speed dial. Nothing big for me, I tend to enter local races as they come up. I’m looking forward to racing in the club’s cross-country league. Who would you like to nominate?